Fall in Love With This Pretty Pet! Do you want to take care of a cute CAT ? It's so lovely that I'm sure you will fill in love with it. Try your best to make the cat heathy and beautiful, it's the goal of this game! The CAT needs to bath, dress and play with. Finish washing task step by step , keeps your pet away from hospital and Make them beautiful so they can bring more happiness to you. Moreover, you can take snapshots for them and share your happy with your friends on Facebook and Twitter, we are pretty sure in those time that you stay with these pet babies, you’ll fall in love with it!!! You get a garden where keeps animals like kitten ,bunny ,monkey and puppy. One day ,you meet a baby in your garden without anyone around him, he seems not well . So you took him to the hospital immediately. After taking body temperature , infusing ,measuring blood pressure and taking X-ray picture ,baby come to life. Then you took him home and clean him with nozzle. After that you went to your garden to feed your animals. You see two monkeys playing jumping games and kitten are running. When you go back to home ,the baby are practicing motoric skills and says he will practice memory tonight. You buy a shirt and trouser for him next day.and when you are cutting your mustache you find it's a dream. 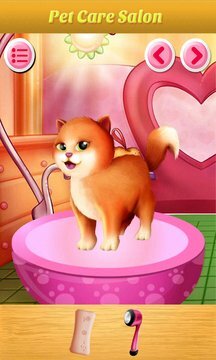 Open PetCare Game , You will get a lovely pet who needs to bath. You need to wash it step by step using soap, nozzle, towel, blower and whisk. This will help you to keep your pets away from doctors .After that, you can come to the dress up room to choose the cutest clothes for them, as well as the pretty neckties, lovely hats, colorful glasses and various cute shoes. After these dress up process, you can enjoy your time playing with pets. Pets love play balls, they will show their lovely smile to you when you are playing balls with them .A snapshot will be taken to remember you this unforgettable time! ★ Arrange dates between animals of different species and produce animation designs! ★ Beautiful and colorful dress up tools and make your pet like a lovely toy! Here we have Baby Cat, Pet Dog, Baby Owl，Beautiful Fox，Cute Rabbit, Pig and Little Mouse. you want to take care of them by yourself and play with them happily. 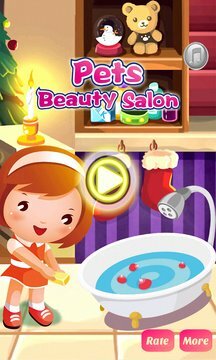 You can clean the pet's room, Wash, Bath, dress up, make up and make over your pets. Also you have many different kinds of food to feed them, such as milk, toasted bread, fruit and so on, after eating and drinking enough, you can play with the pets in the bedroom or outside.Through a little knowledge and special care, you can make your pet a healthy, happy part of your home for years to come.